So plz suggest wt I need to make him learn in this age... shall I take his study or not? This is question we received in our regular what’s app group. The intent behind the question is clear, it is a query raised by a well-intentioned parent. A parent trying to do her best, a parent wanting to gift her best to her child. Also, a parent engulfed in the age old concepts of parenting….I feel as we progress from one generation to another, only the faces are changing, parenting still being the same. Parenting is a journey which we need to take with the child. We need to unlearn, unwire, we need to re-learn. From a perspective of how can I teach my child, the focus should shift towards how can I co-learn with my child? 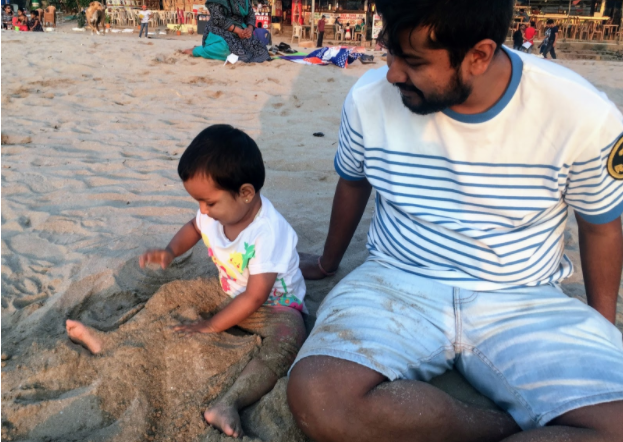 My blog on My transformative journey as a parent is a good read to delve into my journey of how my perspectives changed while co-learning with my daughter. On this blog, I attempt to pen down my thoughts, my experiences, my journey, my observations, my awakenings to break the notion that we need to be experts to home-school / unschool or provide a conducive environment to the child. Gaining knowledge through reading well-established principles on parent-child communication, undergoing training as a parent are a few techniques that will assist any parent. However, if you are not able to do any of these, you can still provide a conducive environment to your child to blossom. Parenting can be as simple & fulfilling as taking our children to a garden, playing in the rains or as complicated as getting inappropriate toys/ unnecessary flashcards and then being supremely insecure of our parenting choices. These simple words form the premise of my life as a parent. These words resonated with my observations of my daughter and other children coming to my workshop that lead me to trust, ‘that my child is learning in every moment of her life’. This blog is only an indication of ideas on “engaging children productively” that are anyways available on any conscious, meaningful, respectful parenting styles or on any progressive pedagogies that exist in the public domain. 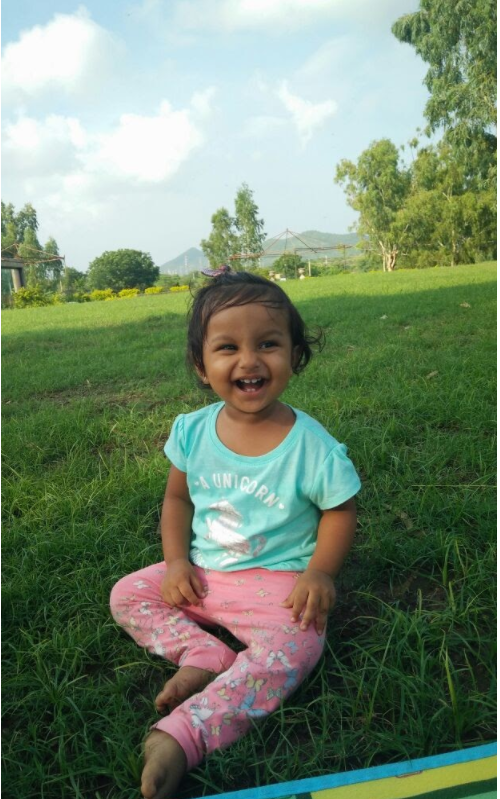 What I have attempted to do here is to amalgamate all what has inspired me, all what I have observed and all that I have implemented or I intend to implement with my daughter. This blog can only unleash its full potential when read in conjunction with the reference links that I have shared on the blog. The activities/ learning spaces that I expose my daughter to are based on my sensitive observations of my daughter’s day-to-day life. I share my journey with a wish, with a hope that you as a reader through my experience are able to transform your perspective, are able shift your intrinsic, conventional parenting style. It requires great power to walk away from being a “plagiarist’ version of the previous generation or from simply falling into the trap that the society lays before us. Our insights as parents from observing our children in a non-judgemental way helps us truly understand the heart, mind, body and soul of our child. Before, reading any further, I request the readers to take a moment to unlearn and to read with an open mind. Activities from birth– a child has come into this world. So, every thing that a child looks at is new for the child. The child just needs to be placed on his/ her back and left to observe. The parent can be in the vicinity silently observing the child. 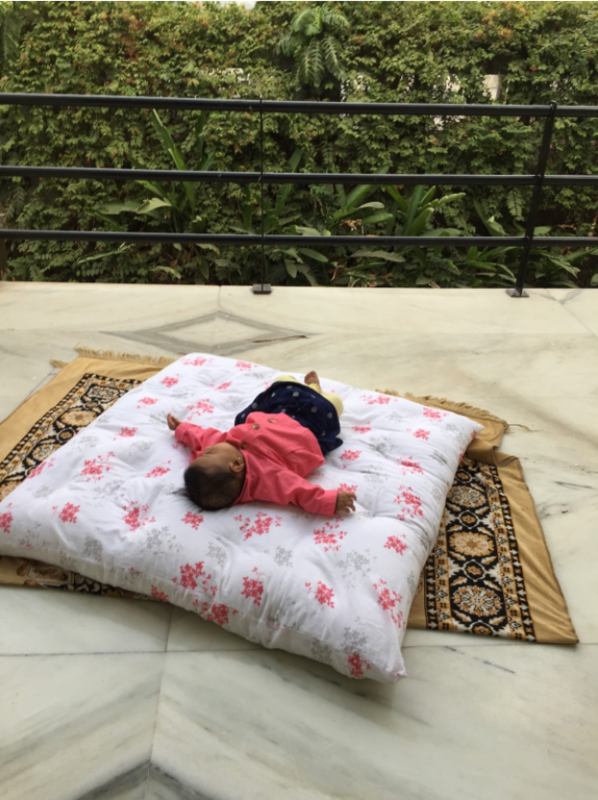 We should start placing the child’s mattress in the open areas, in the garden, in a balcony. We should connect our children with nature, nature is the third teacher. Let your child observe the birds, the animals, the various sounds, the beautiful fauna. As a parent, we should consciously adopt the role of a facilitator engaged in observing our children. For instance, if I am cooking, I would take my child with me and let her be on mattress/ mat on the kitchen floor. If I am working, writing, thinking, reading, I would let the child be on a mattress/ mat around me. There is no need for toys at this point. Also, as much it is of utmost importance to engage with the child, independent play in a safe space should be encouraged. We can perhaps give just one open-ended toy at the age of 6 months. One age appropriate toy is enough for a child to be engrossed in for a few months. Once we start observing our children sensitively that is without any interruptions, we will commence learning and gaining insights into our child’s heart, body, mind and soul. Through my life experiences, I have awakened to the reality that child-directed learning is the only way real learning can happen. As human beings, we will find our learning journey. To give an analogy, I observed that my child is intrigued by the presence of a dog, I took my child to a friend’s house who has child friendly dog. She engaged with the dog by touching the dog, she did get scared when the dog tried to lick her. At this point, as a facilitator, we need to understand our child. We need to let our child know that we understand that he/ she didn’t like being licked. We give our child a lending ear without any explanations. I have come to experience that ‘I hear you’ are the most powerful words then ‘I love you’. I then shared stories on how dogs lick when they want to show their love for someone. After a few days, when my daughter encountered a dog, she was fine getting licked, getting pushed to the ground. There is a possibility that some children will intrinsically love getting licked by dogs or some may not. That is fine. 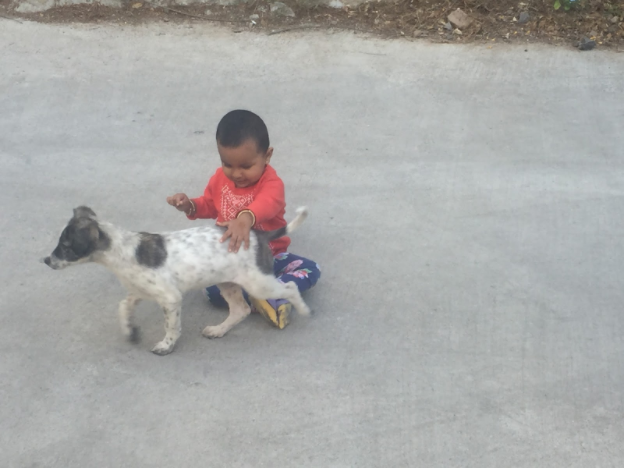 As of today, my daughter plays with street dogs and she has self taught herself on ways to befriend dogs. Now, the question here is what is the child learning? What am I teaching? In my opinion, compassion and love for all living beings is what children are born with. Our role as parents is to nurture their innate qualities so that they do not lose their spontaneity and innocence. Raising kind and compassionate human beings is a service to mankind, to the upliftment of the whole society. If a parent observes a child being interested in plants and flowers, let the child touch and smell the different textures of different plants and flowers. We might not want to see this as an educational opportunity and talk about the name of flowers….just let the child enjoy the process of exploring. There is time and place for knowing the name of flowers, don’t rush into it. Let the child ask you the name? That means you might have to wait for 2 years or one year….but, I insist, please keep on hold any structured agendas. If the child shows interest in the food you are eating, create a food mat for the child. Let your child play with steel and wooden utensils for a rich sensory experience. This is what I did when my child started showing interest the food we were eating. The early stages of a child’s life are all about offering a rich sensory experience. From ages 0 to 7 years, we as parents and facilitators need to understand that children are making a sense of the world through touch, smell, taste, hearing, sight, body awareness and balance. It is only through sensory play that children develop their fine motor skills and gross motor skills. Now, again, the question is what are children learning? Children are absorbing the sounds and smells from the kitchen and therein getting a rich sensory experience of sight, smell and touch. 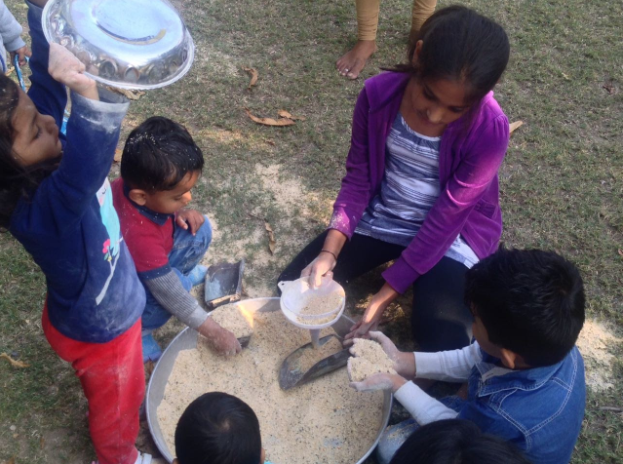 More importantly, our children develop a strong connection with food, child learns to respect food, this is first step towards letting the child learn to eat independently. A kitchen in my experience is a rich source of a sensory experience. Infants/ toddlers/ young children ‘smell’ the food being cooked, ‘touch’ different food objects, utensils, ‘hear’ different sounds, ‘see’ variety of objects. Toddlers and Young children can engage in hours of pretend play, they really might not need the fake looking kitchen sets that the toy companies keep marketing about. Toddlers can be given a few vegetables, pans and ladles and here you have countless hours of play and real learning. 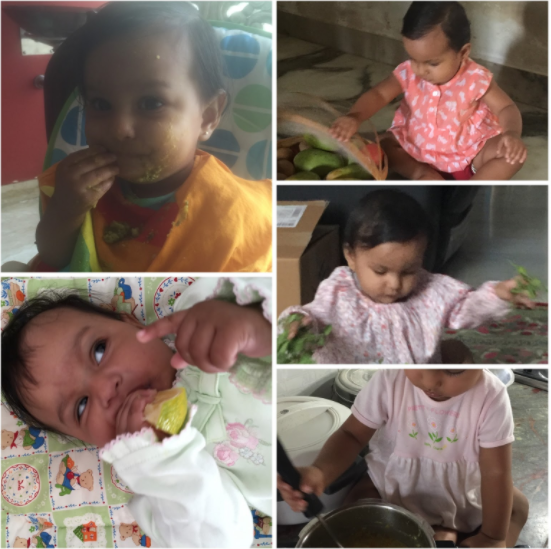 When children engage in real tasks of smashing food, peeling, chopping etc, they get a sense of responsibility besides ofcourse developing their fine and gross motor skills. What is a food mat? 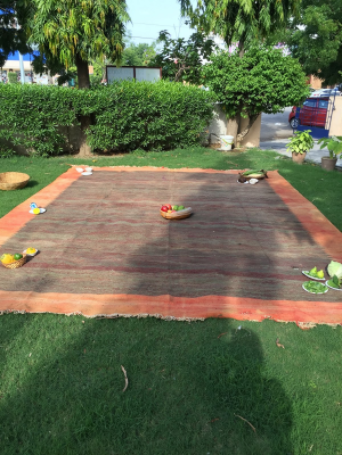 Food mat is essentially displaying different sort of food materials on a mat and letting our children crawl and touch different fruits and vegetables. If the child is not crawling, but, showing interest in food, let’s say the child is at the age of 9 months, we can still create a food mat for our child. The child might roll over to reach out. The child might communicate to taste a fruit, we can cut and let the child explore. This again is a rich sensory experience. If we are not able to create a food mat, it is enough that we let our child touch and explore a bowl of fruits. The idea is we should always follow the child’s lead. We might see tonnes of ideas on Pinterest on activities for babies & toddlers. But, we should instead of setting up this activity, learn to observe our child and follow the child’s direction. If an open ended activity on Pinterest coincides with the child’s area of interest at that stage in a child’s life, yes, we should go ahead and execute the Pintrest idea. We should learn to let our children built their curriculum. We should to the extent possible get disinvested from the idea of “teaching”. For instance, typically, children in the age group of 1 to 2 years are interested in pouring water. A parent might in ignorance say it in a colloquial tone, “my child only likes to pour water and splash water….he is not interested in anything else”. This is a grave mistake parents make. This is a matter of perspective. ‘my child is slow at learning numbers’. At this stage, my child is interested in playing with clay. My child is more interested in learning about animals. My child is very good at woodwork. It is a matter of perspective. If we observe our child being interested in pouring water, we can set up a pouring station or give water and a few utensils for the child to play and explore. Now, what is the child learning? It is a disgrace that our whole meaning of learning boils down to learning colours, numbers and alphabets. When a child pours water, in addition to getting a rich sensory experience of water, the child is understanding how to measure?we need to appreciate the fact that a small child needs to really concentrate to pour water from one container to another. So, these are the essential steps before a child reaches a pre-writing stage. You can use the terms ‘Oh, your jar is half full, and we have a math lesson happening while playing. In our whole endeavour to providing activities for activation of brain and cognitive development, we forget the most important element, that of visiting places of spiritual growth. Taking a child to places of spiritual growth is far more important than taking a child to a colouring class. We should devote our parenting towards the enhancement of the heart, mind, body and soul. Do read this blog to further understand on introducing meditation in a child’s daily routine. Children spending time with family members, children spending time playing with friends, cousins, siblings, children playing in parks, role-play, children spending time with people from a cross section of the society are all instances where children’s social and language skills are being nurtured. Playing with mud, playing with sand, making puddles, jumping in puddles, practicing yoga, walking, nature walk, running, balancing on a log of wood, climbing, sliding down, cycling, rocking are simple instances on how children grow physically. Young children require a lot of physical movement, they aren’t built to sit in one place. Let them run, let them play with sand, mud, sticks, earthen clay. Take them to parks, let them slide, climb on the jungle gym. Let them learn to take age appropriate risks, let them develop their physical side. Let us vouch to give them an open platform. Going to parks and engaging with different playground equipment contributes immensely towards the development of sensory skills of balance (the stimulation of the vestibular system of the inner ear to tell us our body position in relation to gravity) and body awareness (also known as proprioception) – the feedback our brains receive from stretch receptors in our muscles and pressure receptors in joints which enable us to gain a sense where our bodies are in space. To rediscover the role of a parent as a facilitator in a playground, do visit my blog. We should in reality present children with safe opportunities to match with their sensory input requirement. Instill hooks for swings in different locations, provide a mattress to jump on. The child can stop if the child feels dizzy or nauseated and these activities need to be under supervision of an adult. (Inputs from my guide and friend, Yamini Priya on a discussion on sensory input requirements of children). Encourage pretend play, let the child act out his part. In-fact, I engage with my child and my niece in role play, sometimes, I become a chef, sometimes, I am a baby, sometimes, I am a receptionist, sometimes, I am a patient. Sometimes, I might not be involved with the pretend play, I might be listening to the creative conversations from the room next door while reading a book or working on my blog. Pretend play also gives us an opportunity to delve into a child’s inner world, towards the child’s innermost feelings and thoughts. Take the lead from the child and let the child thrive in the make believe world. Let the child imagine things and scenarios and we would soon realise that how we as adults have lost our creative juices long ago. Let these creative thinkers shine. We would be doing a big favour by letting the child’s imagination prosper. 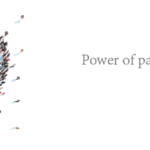 To make a world a better place, we need problem-solvers and we need creative thinkers. To raise creative thinkers, we need to raise kids with imagination skills. Let us vouch to be indebted to the spontaneity and innocence of these souls who have come us to probably teach us how simple life really is . Just give your child crayons and plain paper. Give your child water colours and plain paper. Create vertical and horizontal structures. Give your child chalks and blackboard. Let your child create art with scribbling. Watch the process, engage with the child by matching the child’s scribbling skills. There’s no need to overstep and hijack a child’s art. There is no need for worksheets, activity books, activity classes. Let us do our selves a favour, save this money and spend on stocking art supplies. 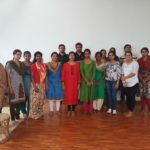 My detailed blog on my experience as a facilitator of a parent-child session on Artdom shall follow soon that will surely assist us in deepening our understanding of our role as a parent during an art session at home. Have abundance of art supplies(in stock), create a dedicated art space, let them experiment, let them explore. Dance with your baby, dance with your toddler, listen to music, put on some soft soothing music at bedtime. Get simple musical instruments, play those instruments with the child and here you have a music class. If we know how to play a musical instrument, we should just play the instrument. If we are learning how to play an instrument, we should take our children with us to our music class. We should sing to our children, share stories, read stories to our children. We should do all this to engage with our children and not to set up an educational experience. 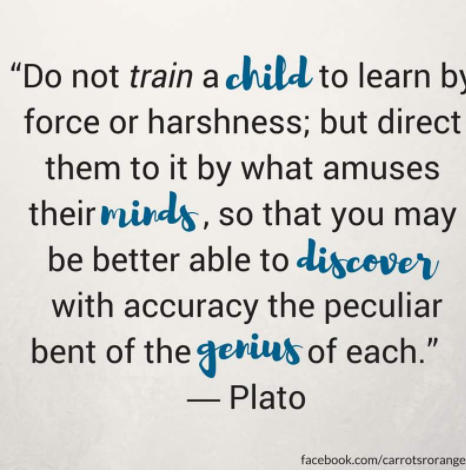 If we follow the path of observing and providing opportunities for self directed learning to our child/ children, we will never have to go to any hobby classes. While guides/ teachers are required for certain learning experiences, we should refrain from bombarding our child’s routine and over stimulating with a series of activity centres; hobby classes. What we can instead do is direct our child’s current interest to specialized guide. For instance, I have often observed that we as parents enroll students to a series of music classes, dance classes, art classes, sports. What I feel is, children in a specific age group might require specialised training. But, the election of classes should always be based on the curiosity level, the relevance of the specific class with the child’s interest. Taking the above discussion further, let us visualise a 7 year old is interested in jumping, take that child to a trampoline or create a mattress for the child to jump. If we google up, we will get tonnes of ideas on a safe DIY jumping mattress for a child in this age group. This 7 year old is in need of a strong vestibular inputs and is listening to his/her body that is asking them to jump. Let us raise our children who learn to listen to the intuitive inputs from their body. There are many parents who would say, I let my child do whatever my child wants. I never interfere when my child paints an apple as yellow. I invite you to shift a focus and tell yourself, I am a facilitator, I am no one to allow or disallow my child. As a facilitator, I can set limits in certain situations (for eg.where physical safety is involved), but, I cannot impose my own conditioning to invade my parenting journey. In my opinion based on my journey as a parent and a facilitator, free play and boredom leads to new inventions, cognitive development, self discovery, independence and social interactions. Kids should have scenarios where there’s nothing to do and they will invent a new play or a new game. I would in-fact encourage parents to offer free spaces, opportunities of free play, no conditioned structures, space & time free of planned activities and then, take a back seat to appreciate the magic to unfold. The only condition during this time is that children shouldn’t have any access to any form of electronic media. To re-phrase this, children should anyways have no access to electronic media. Watering plants, helping with the dusting, mopping the floor, organising are some of the household chores that kids not only are very happy to participate in, but, these chores instill in the kids a sense of responsibility. The foundation years (Age o to 7) is when we can establish a real sense of the adult world. If we wish to have an equitable society where men and women participate in discharging their duties towards the household chores, if we really wish to impart life skills, let them participate in sweeping the dust off the floor, mopping the floor, dusting, making the bed, cleaning the utensils, folding clothes. Give them age appropriate real tools. I had once read somewhere (I cannot recollect where, so, i am unable to give credit). “Children are real people, they need to be given real tools”. The everyday tasks of playing with water, feeding animals/ pets, caring for pets, climbing stairs, playing with playground equipment, playing with animals, watering plants, eating food independently, smashing the food and eating, playing with clay, cooking food(washing fruits & vegetables, smashing mush, smashing potato are the basic tasks that children can help with). Do read this blog to get a deep insight into introducing age appropriate life skills to kids. Toys and activities should be open ended. Also, the mantra should be “less is more”. There is no need to buy expensive and lot of toys. Firstly, as my friend & guide, Yamini, once mentioned, kids who are given abundance of toys can’t learn to value things. Secondly, I feel, kids with abundance of toys are not able to concentrate on one toy. So, at any given point in time, the child should only have 1 toy which can slowly increase to 5 toys. The beauty of open-ended toys is the palpability that kids can play with these toys for infinite time, there is no correct or incorrect way of playing. There is no ending point, there is no psychological pressure of task completion. Examples of open-ended toys would be wooden blocks, cars, ribbons, cotton & silk scarves, animal figures, dollhouses, balloons, puppets, dolls(made out of wool and not the plastic ones), kitchen equipment, home-made play dough, clay, sticks, shells. Also, before introducing any new toy, always observe the interest of your child. For instance, I introduced blocks to my daughter only when I observed her stacking a few bottles sitting on a dining table. Activities can vary from art activities, water play, sand play, mud play, gardening, watering plants, playing with animals, feeding animals. In the end, it is not so much about selection of toys/ activities/ after school programs. It is more about our commitment towards a philosophy that entails us towards counter-intuitive ways of banishing the use of ‘right and wrong’ and let kids manipulate toys in a manner they deem fit. Examples of close-ended toys would be electronic toys, jumpers, bouncers etc which are detrimental to a child’s growth. If we do choose to offer close ended toys like shape sorters, puzzles, Lego blocks, there should be minimal or no intervention from adults on the correct way of playing these toys. Let the child figure out which shape fits the sorter, let the child create his/ her own play with close ended toys. In all likelihood, children create their own play with shape sorters. Children, typically innovate, they take their time to decipher the so called ‘correct’ way of playing with these toys. 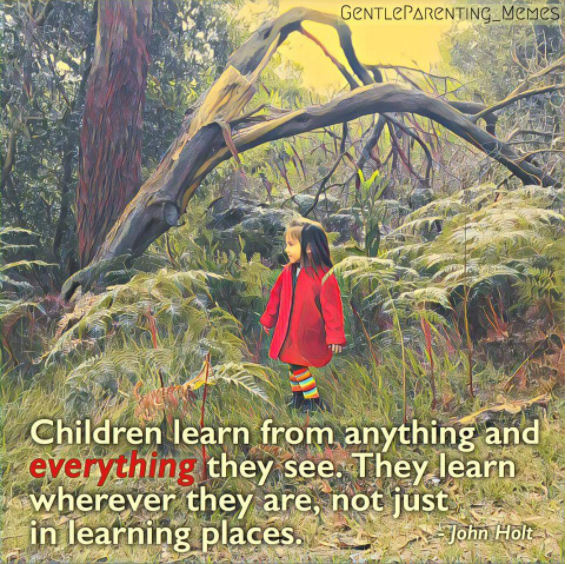 Have immense trust that your child is learning and thriving in each and every moment that the child is living. Human beings are born with an innate ability to learn and they will learn whatever there is to learn for their physical, emotional, social, spiritual and sensory development. Facilitate their process, offer open-ended toys, offer an unstructured space for them to thrive. Above all, trust them. Please stop labelling kids as shy, good, bad, clever, naughty, mischievous, bright, intelligent. Accept them for who there are, love them for who they are. Any book that you might read on parent-child communication stresses on this cardinal law. We really really need to stop labelling our children. We need to love them for who they are, we need to accept them for who they are and love them unconditionally. I am often misunderstood when I offer my suggestions and many parents feel that what I am essentially suggesting that the child should be left to mend his/ her own ways. While the child needs a lot of freedom, the child also needs to be gently guided towards a set routine, safety issues. But, we should use our interruptions sparingly and only when it is absolutely necessary. Also, it is important to create a safe space, so that, the need to say ‘No’ reduces. It is my belief in creating a safe space that lead me to Resources for Infant Educators (‘RIE’) and we can read more about creating a “Yes” space on this blog Indoor Playspace by Janet Lansbury. As we commence the process of trusting our children, we acquire an art of appreciating the little miracles that happen in everyday play and an otherwise ordinary day will suddenly seem as an incredible day filled with real learning and immense joy. Real learning can happen only through play and through a process of fun. Let us learn to let our children ‘live’ and all the life learnings shall come to the child in a harmonious manner. We will slowly and gradually shy away from compartmentalizing learnings(physics, math, language, chemistry etc etc ) and surrender ourselves in the complete belief that children will learn whatever is there to learn for their mental, cognitive, physical, spiritual growth. To summarize, a parent needs to work on the principle of trust and ‘non-judgement’. Parents need to offer open ended toys & activities. Not every opportunity needs to be an educational opportunity, have trust that the child is learning in every moment. 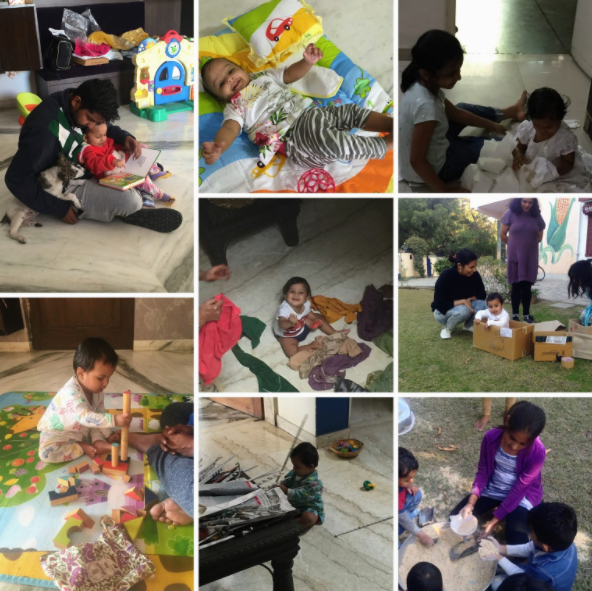 Being busy and keeping the child “busy” are concepts that we need to introspect about. To conclude, I will direct my readers to this link Sensory activities for kids which has a detailed list for activities for children in varied age groups to engage with. 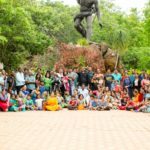 My purpose for this blog was to transform the perceptions of “doing something” for children towards understanding and accepting that children are learning in every moment of their being. This is simply awesome topic explained in a very holistic way of facilitating kids for highest good..
Next Next post: Various Whatsapp Groups.